It seems like the last few days, in fact the last week have been a whirl of buying. Holidays, oops, forgot to mention that we are going on holiday! So apart from holidays, there were suites, hoovers dash cams and cars to look at, admire, assess investigate and purchase. Anyone would think we’d won the lottery. Now that would be unlikely because you have to buy a ticket before you can win and there is the downfall! Crap – It goes into the bin. The more you can fit into this pile the better. As usual, it’s really amazing the things you find in the back of a drawer. Things you’d forgotten about, things you knew you had but couldn’t find (previously filed!) and the things you find and haven’t a clue what they are, or why you were keeping them. After an hour of this I’d halved the contents of the drawer, filled two bags of rubbish and filed away numerous things, never to be found again. I just know that next week I’ll suddenly remember why I was keeping a 20mm long piece of dried clay in a zip top poly bag. After lunch I started another painting. This one was of a real place it’s based loosely on a photograph of the Forth estuary at Torryburn in Fife. I’m quite happy with it at present, but I’ve a few bits and pieces to add and maybe, just maybe I’ll post it tomorrow, all being well. I went for a walk along the canal in the late afternoon, just to get some fresh air in between the rain showers. 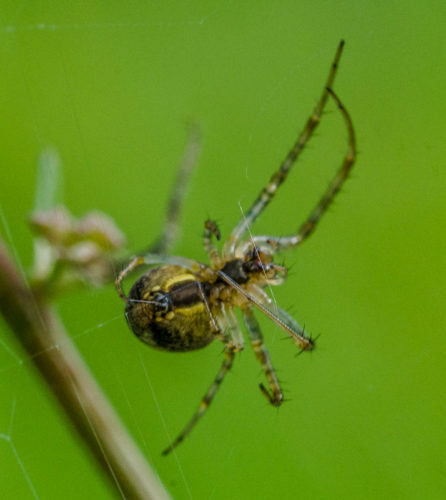 It was too windy for any decent insect photos and the spider was the best I got. It was only when I was post-processing it I realised it was in the act of spinning its web. That’s my PoD. Drove into salsa tonight and used the dashcam again. The video quality is really amazing. It even made a couple of ’emergency’ photos which it stores in a special ‘private’ folder. Impressed as I wasn’t actually braking hard, honest officer. Went to pay for parking at STUC and a prick was trying to talk to someone important on the phone that he had pressed between his shoulder and his skull whilst trying to feed about fifty 20p coins into the machine from a poly bag he was holding. It kept rejecting them then telling him to take his money, he kept on doing exactly the same thing again. After two iterations, I said to him that there’s a limit to the number of coins you can use in these machines. He looked at me as if to say go away old man. So I just said “Just trying to help and that’s what you get. WANKER.” I’m sure the person on the other end of the phone already knew he was a wanker, but I was said it loud enough to let them know that I knew too. I went across the road put in my £2.50 (no 20p coins were used) in another machine and came back as he was retrieving his ticket. It’s simple really. People who’s brain chip is an Intel Celeron single core shouldn’t try to do difficult things like parallel process. That’s only going end up in tears. Also, that’s what he gets for raiding one of his kid’s piggy banks to get his parking money. Just to annoy him more, I waited until he was back in his car and crossed the street again and photographed him. He’s sitting somewhere just now thinking “What’s he going to do with that photo?” No, probably he’s forgotten. Like my new dashcam, his brain chip will delete old data to make way for new stuff. You have to do that when you’ve only got 128k of RAM. That last thought came from the tidy up today. I found a 128k memory module for a Sinclair QL (c1984). 128k what could you store on that now? A really small photo? About 8 seconds of music? Just shows how time and technology has moved on. Salsa was great fun with the beginners starting to get adventurous with Exhibela and Exhibela Ronde. We even taught Jamie G a move we called Setenta Abaho. We’ll be teaching our own class soon!